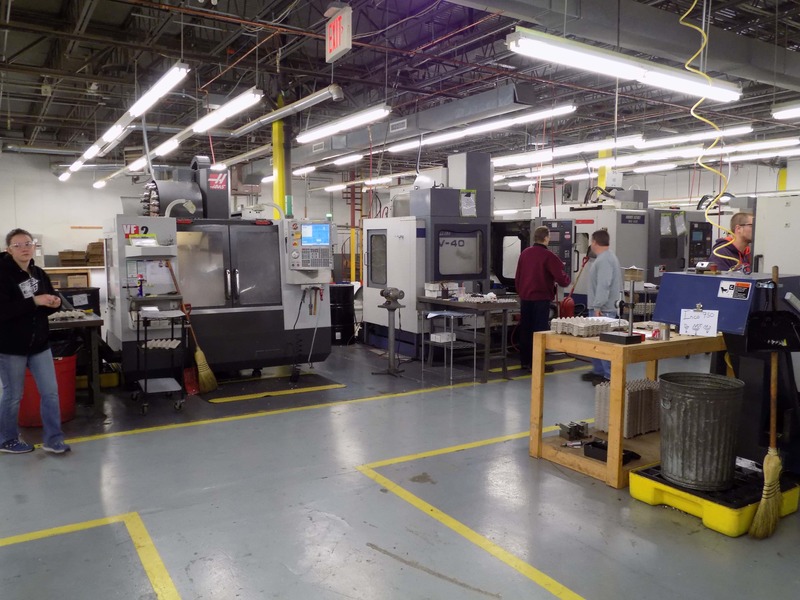 Fleet Machine Co. was founded in 2010 to dramatically outperform other contract manufacturers by fusing advanced machine tools, automation and custom software to achieve what they call “Zero Manufacturing”. The team at Fleet Machine take pride in their ability to produce zero defects, zero missed delivery dates, carry zero part and material inventory, and maintain zero process inefficiencies. 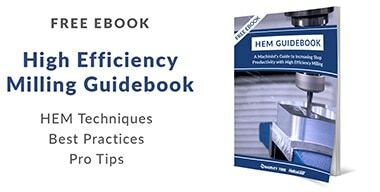 Every strategic decision and investment that they make is based on this philosophy of eliminating waste and human error from the manufacturing process. For Manufacturing Day 2018, the team at Fleet Machine hosted several shop tours for Harvey Performance Company employees. Employees across all departments from Customer Service and Marketing to Finance and Accounting were given a in-depth tour of Fleet Machine’s manufacturing process. Josh Pregent, co-owner of Fleet Machine, was kind enough to host the tours at his shop and talk to us for this post. We talked with Josh about manufacturing automation, the challenges of obtaining AS9100/ISO9001 certification for your business, and the advantages of different milling machine types. Thanks for hosting our team at your shop. It was a great tour! To get started, tell us a little bit about Fleet Machine’s history, and what sort of products you typically manufacture. 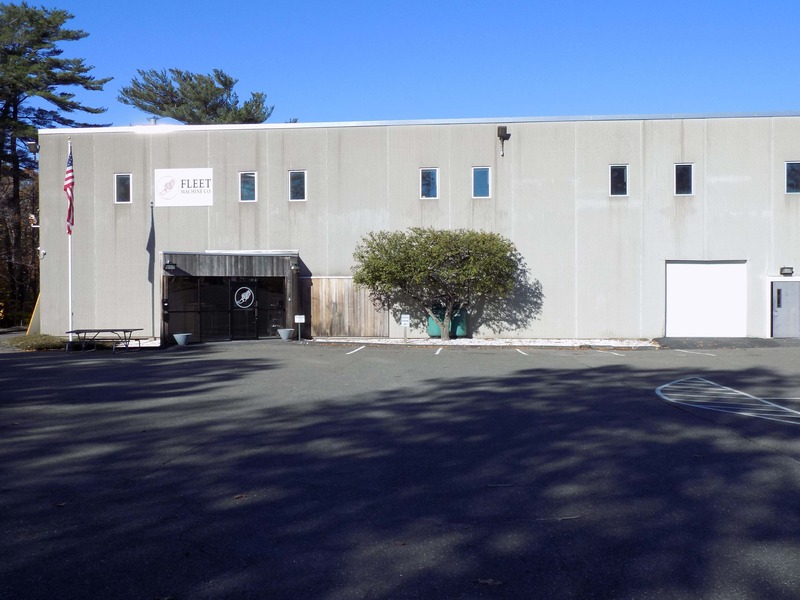 Fleet Machine Co. was incorporated in 2010 in Gloucester, MA to manufacture precision components for the Aerospace, Defense, Medical, and Robotics industries. Fleet’s emphasis on quality, customer service, and professionalism quickly distinguished us from other manufacturers and allowed us to outgrow our original location and expand to our current location. Since our inception, we have devoted our company to automating manufacturing and business processes to minimize human interaction and error in the manufacturing process. Our ultimate goal is to completely eliminate all human involvement in production. This may seem like a lofty goal, but you have to have dreams! How did you first get involved in manufacturing? My business partner and I both worked in a machine shop while we were in college and instantly became interested in manufacturing. Over the years, we advanced through the different facets of manufacturing, learning everything we could. In 2010 we seized an opportunity and decided to branch out on our own to start Fleet Machine. Do you have any advice for someone who is looking to open their own shop? Opening your own shop involves more than knowing how to program and machine. You also need to be willing to sacrifice some of your free time by working long hours to build your business from the ground up. Being a great machinist is important, but you also need to understand the basics of business, and you need to be able to sell your service and maintain a certain level of quality to keep your customers coming back. We saw a good mix of machine types while walking around the shop floor. What sort of machines and software do you have here in the shop? 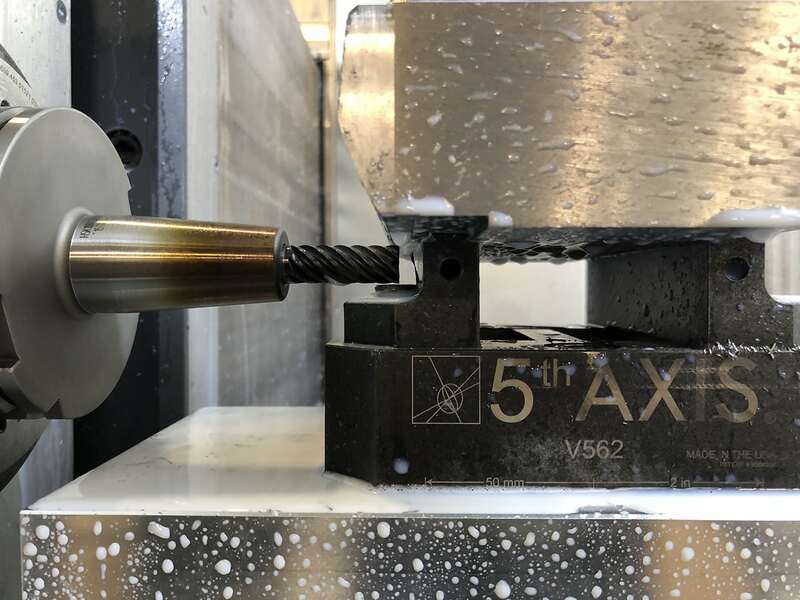 Fleet currently has three two axis turning centers, four three axis VMCs (Vertical Milling), one mill/turn with sub-spindle, and two HMCs (horizontal milling) with sixteen work stations each. It is a long list, but the specific types of machines we have in our facility are listed below. For software, we use a custom Salesforce CRM module, E2 MRP, and Mastercam 2019 for programming. How has the mill/turn CNC machine helped you speed up production? Would you recommend it to others? Our mill/turn machine has helped us increase production by reducing our setup time. There is no longer a need to remove a turned part, get it over to a mill, and set everything up again. Most basic milling operations can be performed on the mill/turn machine, so it is a great time saver. We would definitely recommend this type of machine to other shops. Ultimately, we highly recommend any machine/software/process/ancillary equipment that eliminates or reduces human labor. Manufacturing is a ruthlessly competitive, tech-driven industry and the failure to invest in technology of this type exposes you to over reliance on expensive, scarce, and potentially unreliable human labor and possible obsolescence. You also have both horizontal milling centers (HMCs) and vertical milling centers (VMCs). What has been your experience with both, and do you prefer one style over the other? In my opinion, HMCs are superior to VMCs in every respect due to the additional axis, superior chip evacuation, greater load capacity, and the ability to run unattended with pallet pools. VMCs are still useful for simple jobs and rapid prototyping, but for high production runs we lean on the HMCs to get the job done. What have been some of your keys to success for expanding the business and growing your shop to take on more work? Fleet Machine provides a superior product in terms of quality and value and uses automation and poke yoke techniques to streamline processes and eliminate the possibility of error. We noticed the banner hanging in the shop celebrating your AS9100/ISO9001 certification. How important has that been in your manufacturing process? Having an AS9100/ISO9001-certified quality system will improve every aspect of your organization while eliminating waste, improving product quality, and improving OTD. Imposing the discipline required to attain certification on your company will reveal inefficiencies that you never realized existed. Do you have any advice for shops looking to try and get their AS9100/ISO9001 certification? It is easily worth the investment but it requires attention to detail, extensive documentation, focus on constant improvement, and a real commitment from all employees. It needs to govern every aspect of your business, from the quoting process to shipping. If you don’t have someone who is extremely organized and enjoys data collection, measurement, and documentation, or employees who aren’t compliant or don’t understand the value of certification, it probably isn’t for you. Who are some of your key customers? Some of our key customers (the ones we can name) include Hill-Rom, United Technologies Corp, Rockwell, and B/E Aerospace. We do work under NDAs for some projects so we cannot reveal all of our customers, but they are heavily skewed to the Aerospace, Medical, Robotics, and Defense industries. How do Harvey Tool products help Fleet Machine stay at the top of their game? 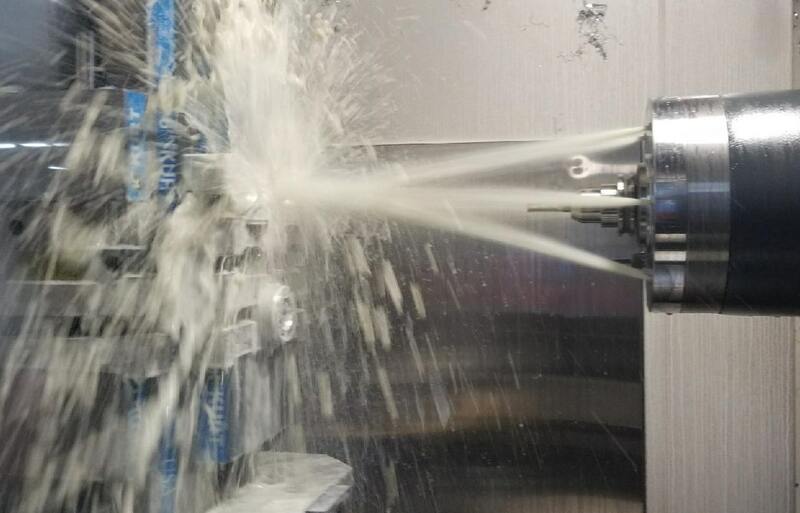 Harvey Tool products are an integral part of what we do, from the quoting process through finishing. Fleet relies on the tooling engineers and technical support team at Harvey to help us produce parts that we wouldn’t otherwise be able to make. What skills or qualities do you look for when hiring a new machinist? Fleet Machine has a robust training program for all new employees. We look for important soft skills such as good written and verbal communication, reliability, a positive attitude, the ability to work as part of team, and basic computer skills. We have found that people with this combination of attributes rapidly surpass people with machining skills who lack these qualities. Being well-rounded is important as an employee in any business, but as manufacturing progresses to become more and more technology-based it will be important to hire machinists with computer skills and technological know-how to stay ahead of your competitors. 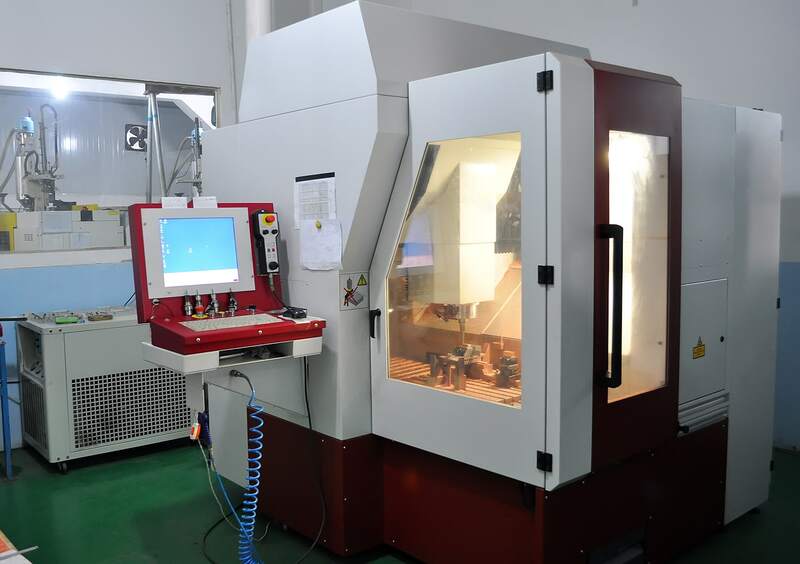 1186 Manufacturing is a high-production machine shop focused mainly on making large parts for the Aerospace industry. 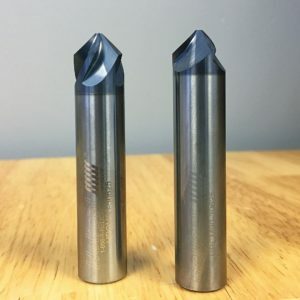 The company was founded by Devon Dupuis, a self-taught machinist who has quickly distanced himself from the competition by adopting the newest machining technologies in his shop. 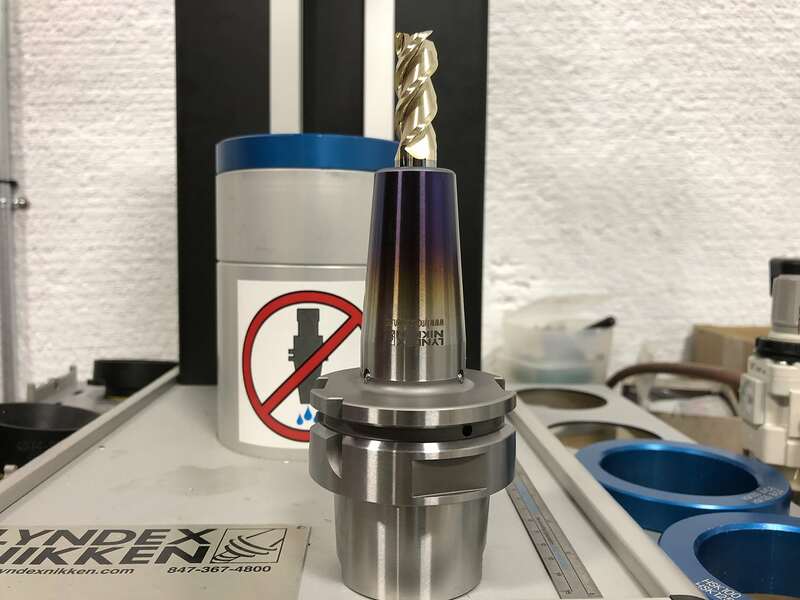 Devon was kind enough to take some time out of his busy schedule to talk with us about his thoughts on 5 axis machining, maintaining a competitive edge over his competition, and the impact that Harvey Tool and Helical Solutions cutting tools have had on his shop’s performance. Tell us a little bit about 1186 Manufacturing and how you got started in this industry. I actually started in manufacturing by programming manual machines like Bridgeports while working in a shop that manufactured suspensions. I ended up learning CNC programming indirectly after working on a couple of programs and just being exposed to it. I have no “formal” training in CNC machining or programming; everything I learned was from my hands-on experiences on the shop floor. I started 1186 Manufacturing in my garage with a Haas Mini-Mill. I was making rings, small firearm accessories, and everyday-carry items like wallets and other small items. After pushing that machine to the limits for a couple of years, I took the leap and decided to expand the business. Pretty quickly we saw one machine turn into four, and we eventually made the switch to the larger DMG Mori machines to be able to manufacture some of the massive parts which the Aerospace industry was starting to send our way. Now, manufacturing parts for the Aerospace industry has become the core of our business, and our machines keep getting bigger. At this point, a lot of quotes come down to simply having a big enough machine to make what these Aerospace companies need. By going big, we have been able to earn a lot of their business over our competition. We actually started with a few Haas machines in our earlier days – a UMC-750SS, a VF-6SS, and a VF-3SSYT. When we made the switch to larger machines, we went with the 5 axis DMG Mori machines and we now have four of those; a DMF 260-11, a DMU 125, a 60 eVo Linear, and a DMC 85 with a pallet changer. 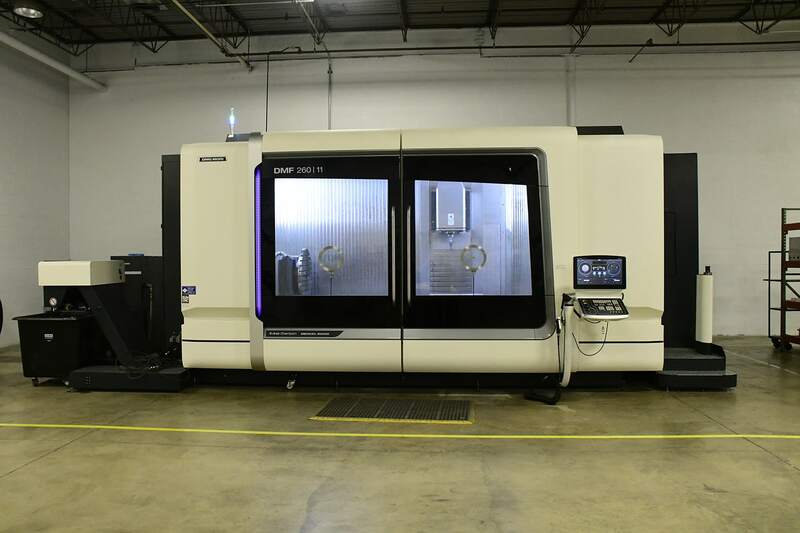 We are hoping to add another 5 axis machine, the DMG 340 Gantry, sometime in the near future. Recently, we had John Saunders from NYC CNC stop in the shop and do a quick tour, so you can see most of our machines up-close and personal in that video (below). That is some serious 5 axis power. 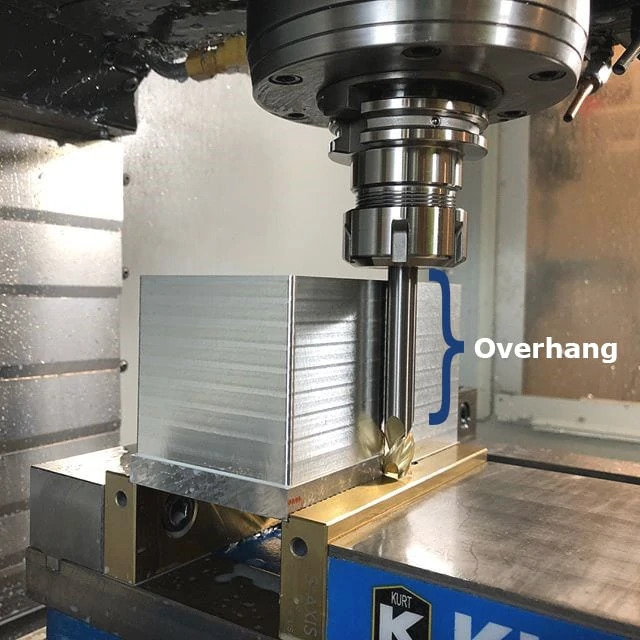 What advice would you have for others when it comes to 5 axis machining? I think that people need to adapt to new technology to stay ahead of their competition. I have been in shops where people are doing 10-15 setups for a single part, and it just wastes so much valuable time. That same part could be done in 2 operations on a 5 axis mill. When you really think about the lost time and the amount of scrapped parts due to the constant moving and misloading during setups, you could have paid for a 5 axis machine with the money you lost. Right now, with software like AutoDesk Fusion 360, it is easier than ever to learn to program a 5 axis machine. A lot of the basic machining principles remain the same; some people are looking at this and making it more difficult than it needs to be. If you can program and run a 3 axis machine, taking the next step to 3+2 and eventually 5 axis machining is not as hard as it may sound. Do you have a favorite material to machine? 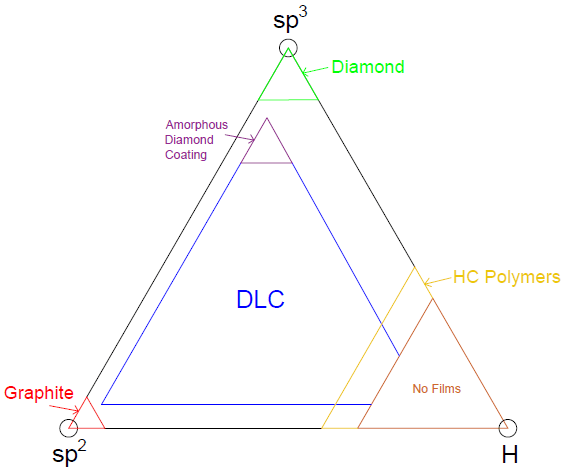 What material has been the most difficult for you? We work with a lot of Aluminum. About 90% of our parts are in Aluminum, and it just cuts like butter, so that is by far my favorite material to machine. We machine so much Aluminum that we regularly go through a 14 cubic yard hopper full of chips in just a week. We are making parts faster than we can even get the chips out the door for recycling. Recently, we have been getting more Stainless Steel jobs, and the A286 alloy has been an extremely difficult material to work with. 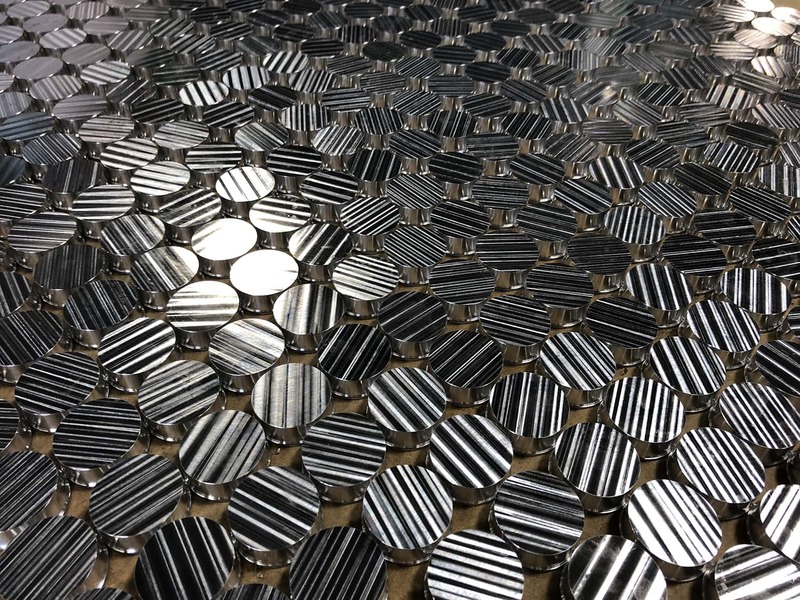 We love a challenge, but it is definitely my least favorite material to machine. 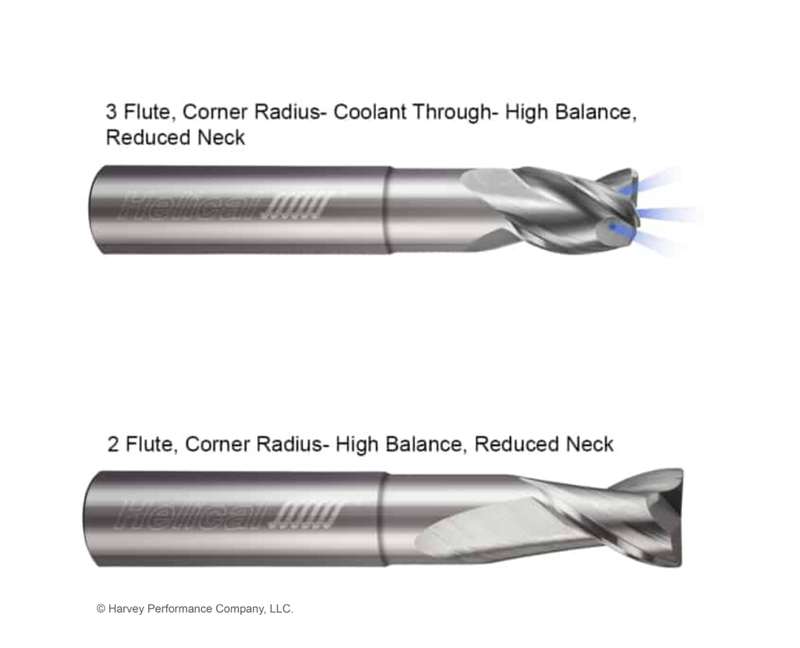 How did you first hear about Harvey Tool and Helical Solutions? I first heard about Harvey Tool and started using their products about 9-10 years ago. I was making much smaller parts then, and would use a lot of the Harvey Tool miniature end mills and some of the specialty profiles for specific cuts. Nowadays, we are making much larger parts, so we don’t get to use the Harvey Tool products as often. When we started moving into our new space, one of our customers saw us cutting stainless steel and mentioned Helical. I searched a few videos online, and saw a crazy test run of a Helical end mill running at something like 10k RPMs in stainless. 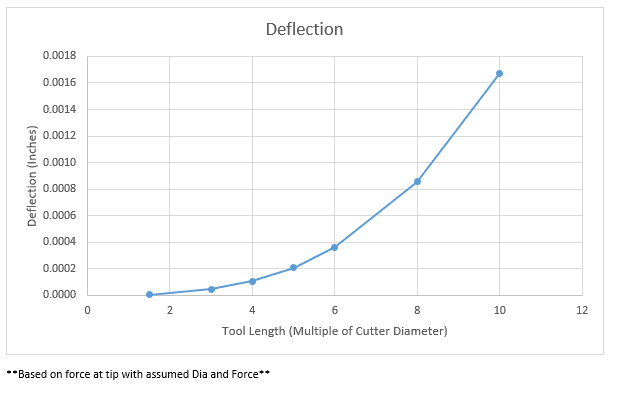 We had only been running at 800-900 RPMs with our current tooling, so we knew we had to try these tools right away. How have the tools impacted your business? We now use Helical tools for everything because we can push them harder than any other brand. 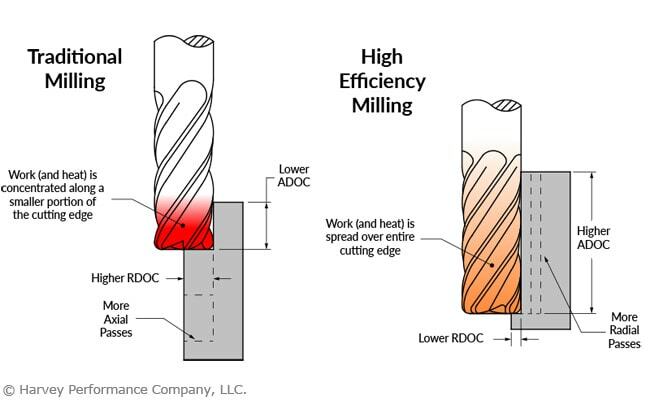 We have performed many head to head tests and haven’t found anything that can compete at the same speeds as the Helical end mills. Carrying reduced neck end mills as a standard stocked item is also huge for us with the 5 axis work we do. 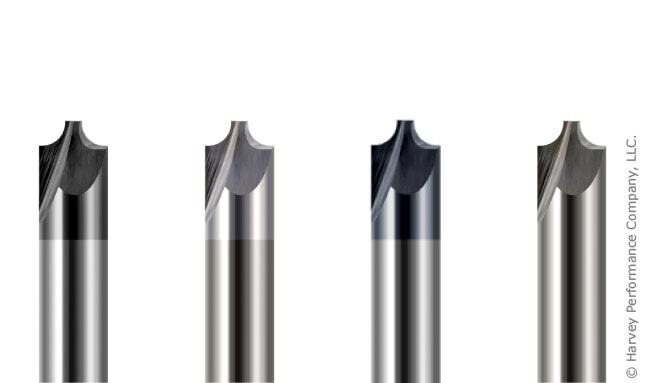 We used to have to buy end mills and grind them down ourselves to get that reduced neck, but we are able to save valuable time by just ordering them standard with our other tools from Helical. In Aluminum, most tools cut like butter, but the Helical ones have always been able to run faster with better tool life. 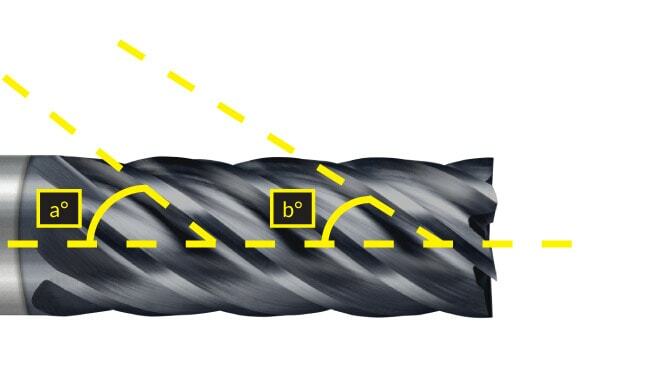 As we have started moving into more Stainless/Hardened Steels, Helical has pulled through for us every time. 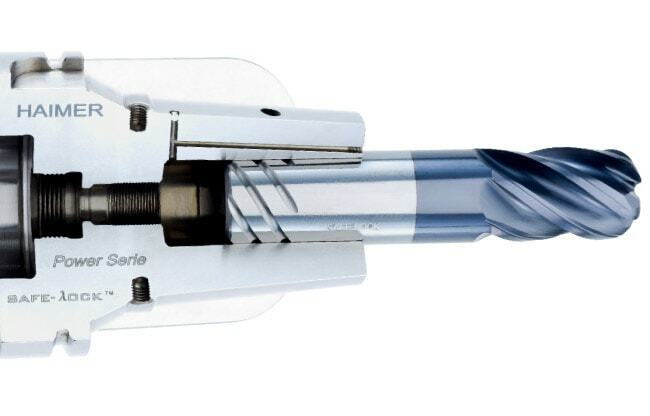 Previously, we could go through a $50 tool from another brand in just one part. 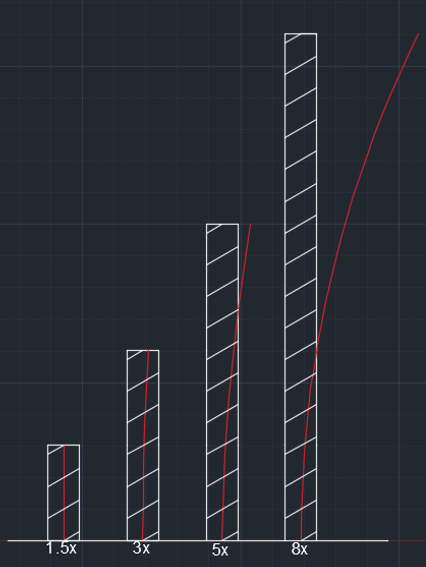 Now, we can get four parts out of the Helical tool, while pushing even faster than before. 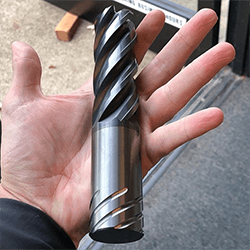 For high-production shops like ours, speed and cost is everything, and Helical tools have constantly outperformed the competition. You were an early adopter of Machining Advisor Pro – how have your experiences been with the software and parameters it is outputting? We were actually an early adopter of the original Helical Milling Advisor after we had it recommended to us by another customer, and so we signed up for Machining Advisor Pro as soon as it became available. It makes sense that it became a web-based software; now we can get updated with the latest tooling information and formulas without needing to download a new version on all of our computers. So far, we have been very happy with it. We constantly recommend it to others. A lot of what I do for speeds and feeds can come right off the top of my head and with some tweaks I can figure it out, but having software like Machining Advisor Pro allows us to double check our speeds and feeds and figure out how we can push the tools even faster. The biggest thing is that it always gets our guys close. No matter what their level of experience is, they can plug the information into MAP and get some great starting parameters that are always on point. What is your key to staying ahead of the competition and winning quotes? In manufacturing, you not only have to worry about competing with your neighbor but also competing with shops overseas that can offer low-cost quotes. 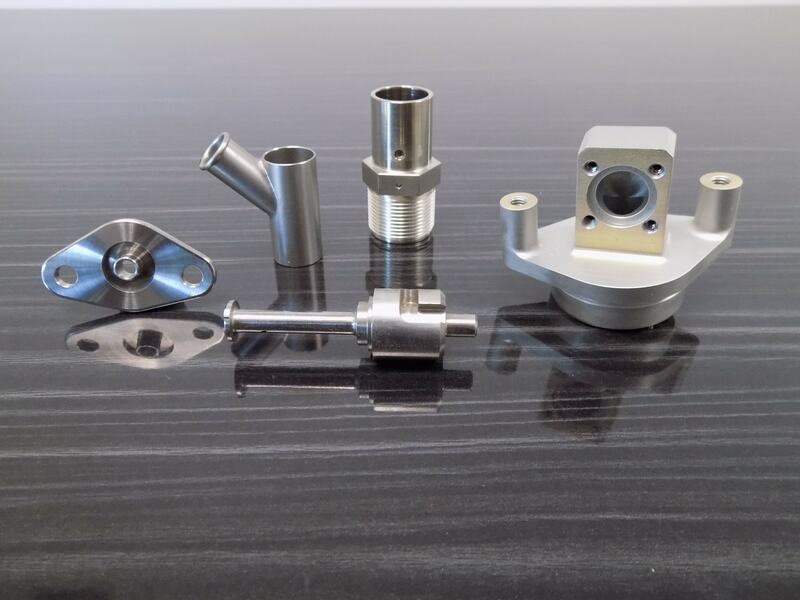 However, we have found that by pushing our machines as quickly as we can and using 5 axis machining to improve our cycle times, we can offer extremely competitive quotes with a faster turnaround. Some of our machines are pushing so hard and fast that it is difficult to keep enough workpieces in front of them at times. My favorite thing to tell customers when they ask how long the lead time will be on a part is that it will take longer to get the material in the shop than it will to make the parts. We can make parts at such an outstanding rate here because of our investment in technology. This is truly what sets us apart from everyone else. What advice do you have for the In The Loupe community? 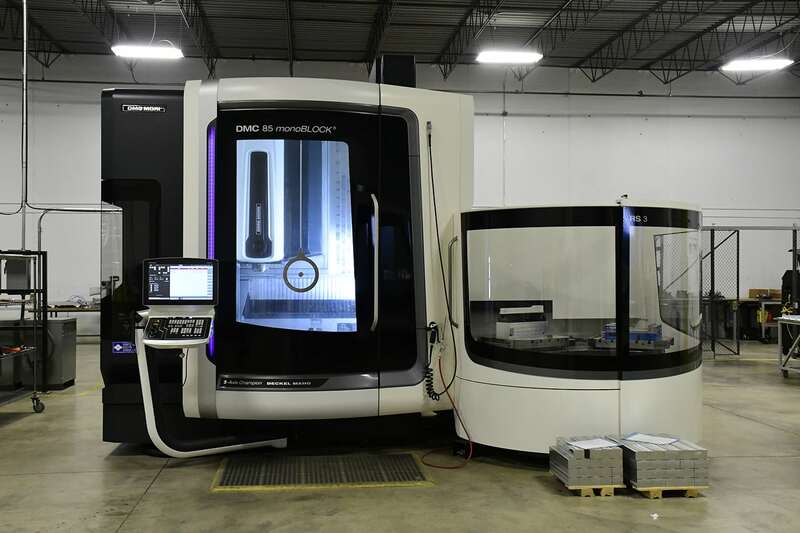 Embrace technology, embrace multi-axis machining, and keep pushing your limits. Losing less time to setups and moving operations like deburring into our machines has saved us so much time and money while increasing our production rates to new highs. 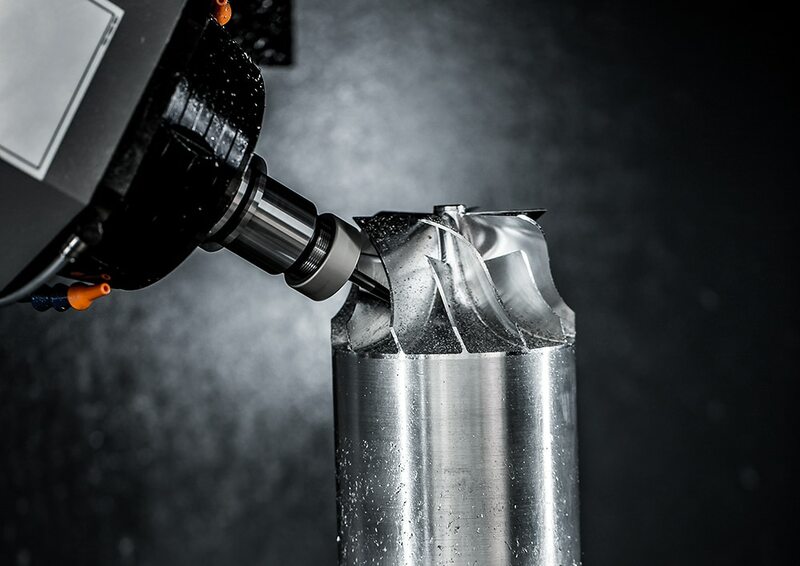 If you are not taking a hard look at adopting some of the new advances in machining technology, then you are already behind your competition. 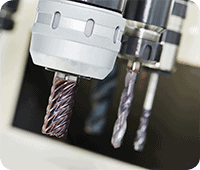 Most modern manufacturing centers have both milling machines and lathe machines. 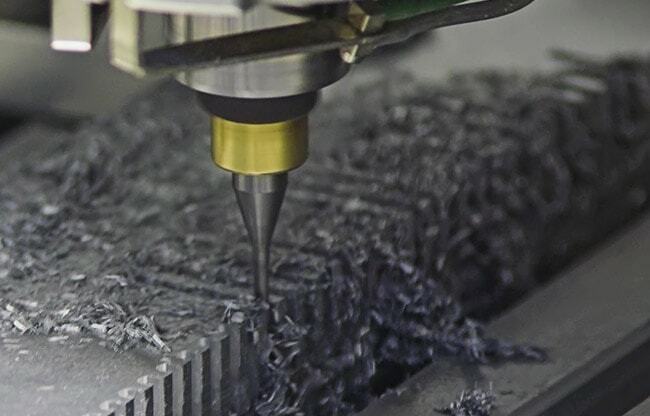 Each machine follows the same machining principle, known as subtractive machining, where you begin with a block of material and then shape that material into the desired specifications. How the part is actually shaped is the key difference between the two machines. Understanding the differences in more depth will help in putting the right part in the right machine to maximize their capabilities. The major difference between a milling machine and a lathe machine is the relationship of the workpiece and the tool. 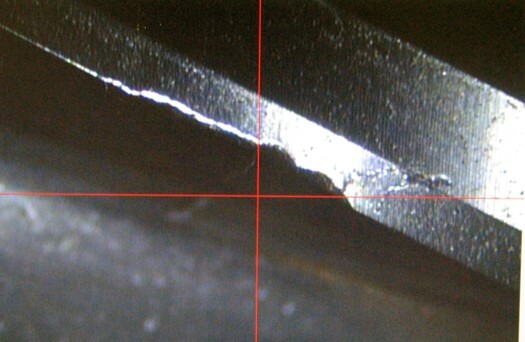 In a lathe, the workpiece that is being machined spins about it’s axis, while the cutting tool does not. 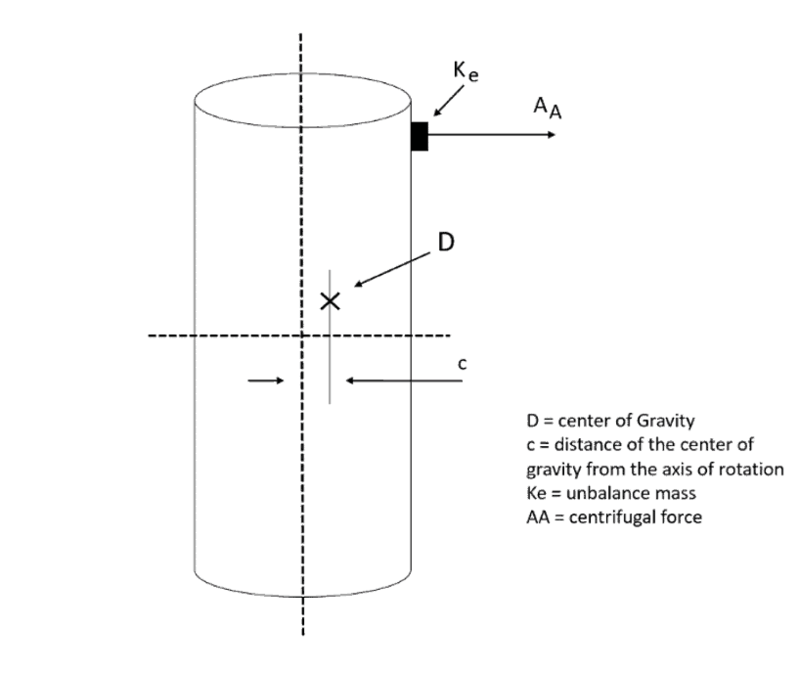 This is referred to as “turning”, and is effective for creating cylindrical parts. Common operations done on a lathe include drilling, boring, threading, ID and OD grooving, and parting. When looking to create quick, repeatable, and symmetrical cylindrical parts, the lathe machine is the best choice. The opposite is true for milling machines. The tool in a milling machine rotates about its axis, while the workpiece does not. This allows the tool to approach the workpiece in many different orientations that more intricate and complex parts demand. If you can program it, you can make it in a milling machine as long as you have the proper clearance and choose the proper tooling. The best reason to use a milling machine for an upcoming project is the versatility. 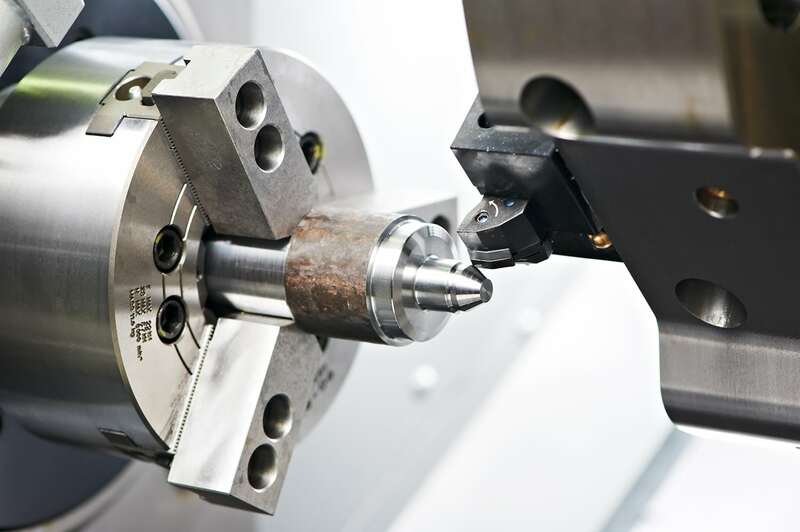 The tooling options for a milling machine are endless, with hundreds of available specialty cutting tools and various styles of end mills which make sure you are covered from start to finish on each job. A mill can also cut more complex pieces than a lathe. For example, it would impossible to efficiently machine something like an intake manifold for an engine on a lathe. For intricate parts like that, a milling machine would be required for successful machining. 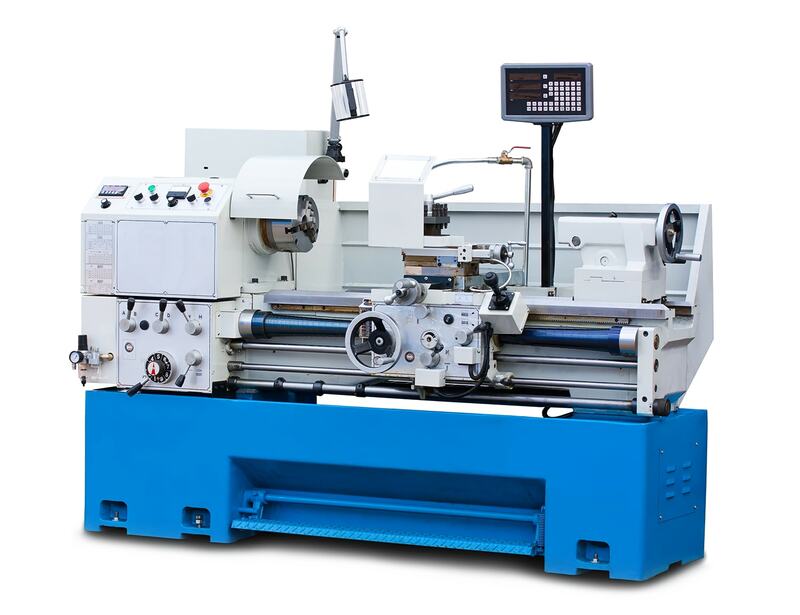 While lathe machines are more limited in use than a milling machine, they are superior for cylindrical parts. While a mill can make the same cuts that a lathe does, it may need multiple setups to create the same part. When continuous production of cylindrical parts is necessary, a lathe will outperform the mill and increase both performance and efficiency.